Portable Retsroom & Shower Trailer Rental in Pennsylvania. Superior offers a large selection of top-quality shower and restroom trailers for events and sites in Pennsylvania. Our well-maintained facilities are great for parties, receptions, concerts or remodels. Both our shower and bathroom trailers come in a range of sizes, and are available for as long or short a time, as needed. Our shower trailers are well maintained and easily accessible. Multiple shower heads and sinks, changing rooms and conveniently placed electrical outlets make them a welcome comfort for guests, visitors, employees or customers. High capacity water tanks are on board for situations with no available water source. Superior has provided shower trailers for high-traffic events like marathons and festivals. Every Superior restroom trailer provides the best in cleanliness. Choose from models with features such as wood grained floors, handicap accessibility, heating and air conditioning, stereo systems and more. Our restroom trailers come with 3, 10 or 11 stations, which provide options to fit events or needs of any size, like remodels, parks and church festivals. Superior portable restroom trailers were used during the 2009 G-20 Summit held in Pittsburgh and the Pope's 2015 visit to Philadelphia. 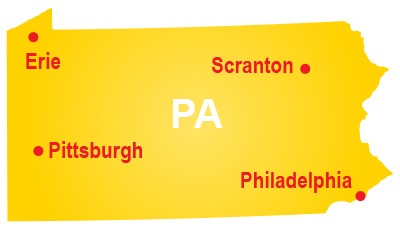 We service many areas in Pennsylvania, including Pittsburgh, Erie, Philadelphia, Johnstown and New Castle. Choose Superior for all your shower and restroom trailer needs. Contact us today to request a quote.